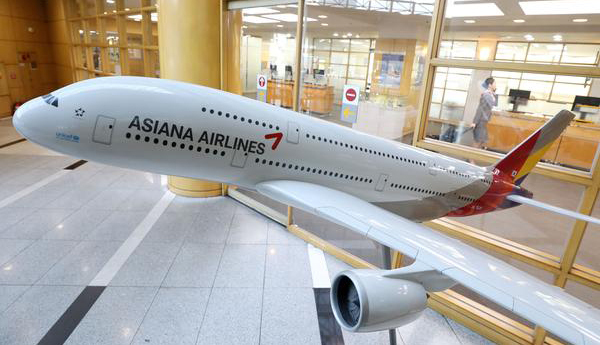 Creditors of Asiana Airlines Inc., South Korea’s second largest full-service carrier suffering from a liquidity crunch, has rejected the revamp plan submitted by its parent Kumho Asiana Group, asking the company to take more practical actions to restore the market’s trust. Kumho Asiana Group on Wednesday submitted a self-rescue plan to the creditors, with pledges to hand over the founding family’s controlling stakes in Kumho Busline Co. as collateral and give the creditors the rights to put up Asiana Airlines for sale if the conglomerate fails to implement its normalization plans over three years. Kumho Asiana Group, in return, asked for 500 billion won ($438.7 million) worth of financial support from the creditors. Analysts, however, noted that a majority of owner family members’ shares in Kumho Busline, the de facto holding company of the conglomerate, are already put up as collateral to rescue the group’s another company, and only 4.8 percent stakes owned by former Chairman Park Sam-koo’s wife and daughter are available for now. Coupled with the proceeds from the possible sales of Asiana Airlines’ affiliate assets, the available Kumho Busline stakes are not sufficient to regain the market’s confidence in the company. The creditors have been asking for stronger measures such as the donation of the owner family members’ personal assets and a new share issue. Market analysts and the creditors also forecast that former Chairman Park would be able to wield power through his son Park Se-chang, president of Asiana IDT Co. who will maintain management control, despite his pledge to stay away from the management. “Even if the creditor group supports 500 billion won worth of funds as requested by Kumho Asiana Group under the revamp plan, there are concerns over creditors’ additional burden of funds due to uncertainty in overall capital raising,” the creditors said, expressing “pessimistic view” of the plan. Asiana Airlines’ main creditor KDB already informed the meeting results to Kumho Asiana Group on Thursday. The group responded that it will come up with a new rescue plan through discussions with the creditor group.